Dandruff is quite common, and nothing can be more embarrassing than itching your scalp all day and little white flakes coating the surface of your hair as a result. Not only does this look unattractive, with dandruff comes severe burning of the scalp and that incessant itching. For more detailed and complete product reviews on benefits and features, keep reading. Luckily for men, the answer to your dandruff woes is right inside your shower. The following five dandruff shampoos for men will help to alleviate that burning sensation in the scalp, reduce the appearance of those white flakes in your hair, and help to suppress that need to be scratching your scalp all day. 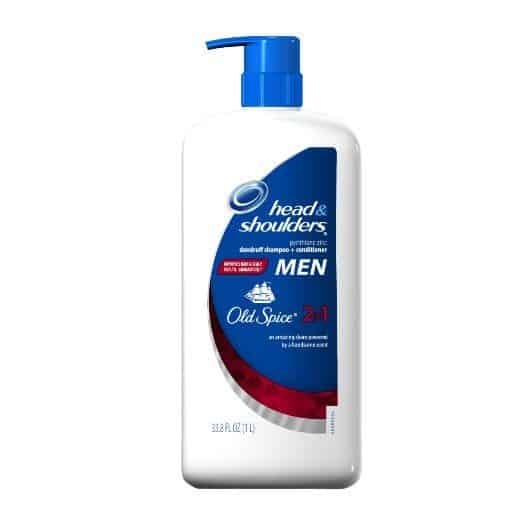 Chances are pretty good that you already know the name Head & Shoulders. They have been in the business of helping the fight against dandruff for the last century, and now they have developed a dandruff shampoo exclusively for men. Recommended to be number one by a panel of dermatologists, this is one of the best dandruff shampoos for men. It combines a unique moisturizing formula to attack the problem at the source and utilizes manly Old Spice scent to hide the fact this is a dandruff shampoo. 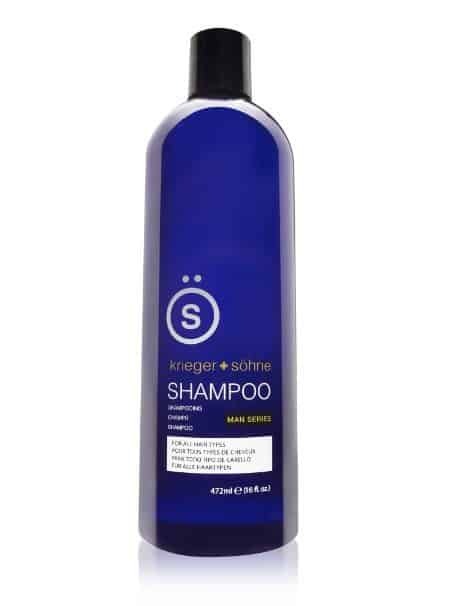 This shampoo has been clinically tested and guaranteed to give you flake-free hair. The unique pH balanced and gentle formula calms an itchy scalp, moisturizes the dry scalp, and helps to relieve irritation. This 2-in-1 shampoo works on all hair types, including chemically treated or color hair. Are you losing your hair? Is your hair thinning? If you suffer from any of these symptoms and you have dandruff, you need a specially formulated dandruff shampoo that will work to attack the problem without exacerbating your thinning hair concerns. The Dove Men Care fortifying dandruff shampoo works to improve scalp health at the source. The unique combination of pyrithione zinc and caffeine work to strengthen the hair while eliminating those flakes. Now you can fight your dandruff and help to restore your hair strength at the same time by using the Dove shampoo. Soon after using the shampoo you will notice the hair is thicker, visibly healthier, stronger, and more resilient. When you talk about the best dandruff shampoo for men, on that list has to be K + S Salon dandruff shampoo. This unique shampoo for men is infused with tea tree oil to help restore scalp health and prevent hair loss. The tea tree oil has been effective for centuries at healing many body ailments, one in particular is the ability to moisturize the scalp, restore hair strength, and eliminate itching and redness of the scalp. Soon after your first time using the K + S shampoo, you will feel the tea tree oil working to moisturize the scalp and attack dandruff at the source rather than masking the problem. Once the scalp is moisturized, dry scalp problems disappear. The healthy scalp will even help to prevent further hair loss in men experiencing a loss of hair. Getting rid of dandruff should not be a complicated process. The reason for the itchy and flaky scalp is simple, the health of the scalp is poor and causing burning, itching, redness, and flaking. Help is on the way with Clear Men’s dandruff shampoo. Clinically proven to restore a healthy scalp by cleansing and moisturizing, resulting in manageable hair with noticeably less dandruff. This unique dandruff shampoo makes use of specialized ingredients that help control and prevent the recurrence of flaking and itching that is associated with dandruff. This blending of shampoo and conditioner first cleanses, then conditions, leaving men’s hair manageable and feeling clean. Clear Men’s is formulated to restore the natural moisture balance within the scalp by utilizing bio-nutrium 10, a combination of ten different botanical actives and nutrients. Tea tree oil, natural mint, and ginseng are a few of the nutrients working to keep hair feeling healthy, looking clean, and elimination itchiness. If you are looking to put an end to your itchy scalp and dandruff problem, Maple Holistics dandruff shampoo could be the solution to your problem. Combines a unique blending of all-natural ingredients that work to attack the problem at the source, while leaving the hair looking and feeling like you just visited the salon. Pure and natural dandruff formula is free of toxic ingredients, fragrances, or sulfates, which means it goes right to the source of concern in the scalp and begins healing from within. Dandruff dust will start to disappear, redness of the scalp will subside, and that uncontrollable itching will be a thing of the past. No harsh ingredients to aggravate the redness of the scalp utilizes the healing power of tea tree oil, rosemary, and sage, to improve overall scalp health. Once the scalp natural moisture levels are restored, dermatitis will be a thing of the past. Reduces the appearance of dandruff by preventing clogged follicles, stimulates the renewal of hair follicles, and also improves circulation in the scalp. Natural ingredients work to combat dandruff and give you back your confidence and flake free hair. When it comes to the best dandruff shampoo for men, you want to look for products that have names you can trust, have been effective at doing what they promise, and are affordable. 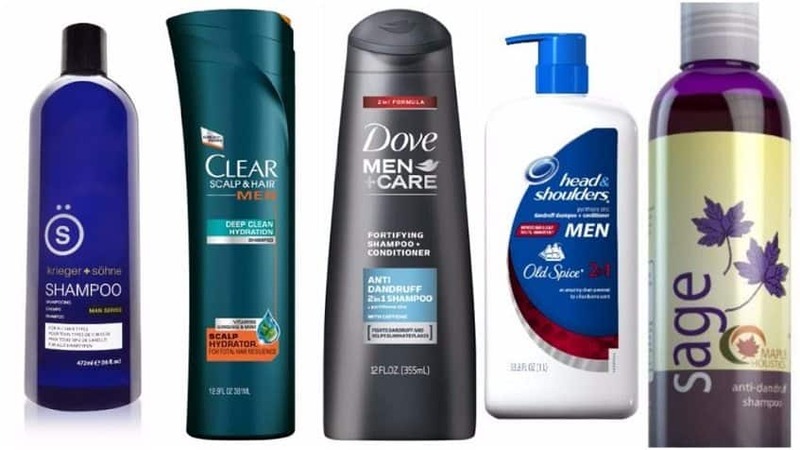 This list of men’s dandruff shampoos contains different products that all have one thing in common, they get to the root of the problem and eliminate dandruff at the source. Those days of a burning and red scalp, white flakes in your hair, and an itching sensation that causes to scratch the scalp raw are all but over. It’s not all the same which anti-dandruff shampoo you choose. Using the wrong one can make dandruff worse than before, and maybe even damage your hair. Things you should consider before getting the shampoo are the cause of your dandruff, ingredients, your hair type, and age. Sounds hard to remember? Keep on reading. Causes and risk factors that can lead to dandruff are as diverse as anti-dandruff shampoos you can find on the market. However, knowing what causes your dandruff is very important before choosing a shampoo that will fight it. Depending on the cause, you will buy the shampoo with specific ingredients to treat exact dandruff you’re suffering from. This condition is also known as seborrheic dermatitis, and it’s number one cause of dandruff. Symptoms are usually red and itchy scalp with greasy skin and covered with white or yellow flakes. This makes it obvious that more often showers or scrubbing deeper when washing your hair won’t eliminate this type of dandruff. You can achieve good results only by using a specially formulated dandruff shampoo. Cold air in winter dries out your skin, which can cause flakes to appear. This is known as seasonal dandruff. 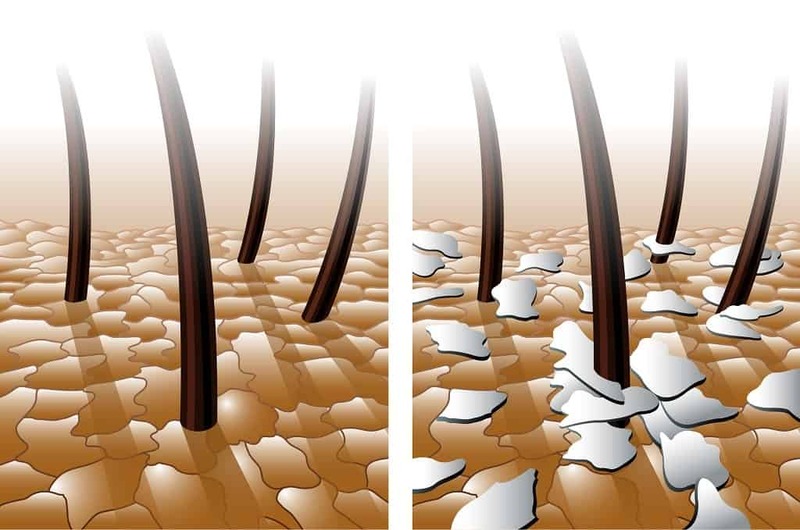 Dandruff caused by the dry skin is different than the previous one. It doesn’t make your skin red and irritated, and the flakes are a lot smaller than in the case of seborrheic dermatitis. Regular use of shampoo helps in cleaning oil and dead skin cells on the scalp. That implicates that not running shampoo through the hair often enough causes dandruff to appear. This fungus lives on every man scalp, and it’s perfectly normal until it grows out of control and causes scalp irritation and dandruff. It’s recommended to treat this fungus with two different shampoos. Using just one may result in fungus building up a resistance, which again leads to dandruff you’re trying to get rid off in the first place. Sometimes hair care and styling products are the ones causing itchiness and dandruff. This usually happens when you’re sensitive to some of the ingredients in them. If you’ve recently changed the shampoo, conditioner or dye, that’s one more potential reason for your dandruff. Certain risk factors make some men more prone to dandruff than the others. Psoriasis, eczema and similar skin disorders frequently lead to dandruff. People suffering from depression, HIV, neurological disease and some other illness have increased chances of suffering from dandruff. Some of the less common reasons can be poor diet habits, dehydration, stress, lack of physical workout or not brushing the hair frequently enough. If you think that regular shampoo can solve your dandruff problem, think again. In the best case, it can moisturize your hair, make it look softer or fuller, and smell good. What it can’t do is solve your dandruff problem because simply it’s not designed for that. Regular shampoos have detergents in them, similar to those found in dishwashing or laundry detergents. They can strip away the natural sebum from your hair, making it easier to damage. Other things you can find in regular shampoos are conditioning agents and protectants, such as sunscreen. Logically, they protect your hair from harmful UV rays, heat damage, and hair drying. On the other hand, anti-dandruff shampoos contain lots of anti-dandruff, anti-fungal, and anti-bacterial ingredients, and act as scrubbing agents. That’s precisely what you need against dandruff or dermatitis. One anti-dandruff shampoo that worked for your friend may not be suitable for you. That’s because they are made with different ingredients that treat different types of dandruff. The names of these ingredients may sound like a nuclear physics, but they’re not really. Once you’ve identified the cause of your dandruff, choosing the right shampoo will be a lot easier. Shampoos that contain selenium sulfide, Zinc Pyrithion, ketoconazole, and tea three oil successfully treat fungi such as seborrheic dermatitis and Malassezia. For those men who have very oily skin, but don’t suffer from fungal infection, Coal Tar is the most effective as it helps in slowing down the buildup of dead skin cells, reducing the appearance of dandruff. If you’re still in a dilemma which shampoo is right for you, the best thing to do is to visit your doctor or hair care expert. How Often Should You Apply Anti-Dandruff Shampoo? Some of the anti-dandruff shampoos are too harsh and can damage or dry out your hair. That being said, they shouldn’t be used more than 2-3 times a week. Others, on the other hand, can be used every day. Keep this in mind especially when choosing shampoos with Coal Tar in them. Using them every day might result in scalp irritation. In any case, you’ll find instructions and list of the ingredients on the label of every anti-dandruff shampoo. What’s most important when battling with dandruff is to be consistent in using anti-dandruff shampoos. Most of them show the first results after only a week. Some men stop there, after noticing that dandruff symptoms relieved a little. Because that’s not how dandruff shampoos work, pause for a week or two will make the results fade away, and dandruff will come back. This is when men think the shampoo didn’t do what the label said, not considering that they weren’t using it properly. Most of the shampoos start to lose their effectiveness after a few months. That’s when you should think of switching them. Another good idea would be to combine the shampoo with some great anti-dandruff conditioner. In situations when dandruff shampoo dries out your hair – which often happens – a conditioner will add moisture, keeping your hair and scalp healthier. How Do You Apply Anti-dandruff Shampoo? The answer is quite simple – the same way as any other shampoo. There isn’t a specific technique for applying anti-dandruff shampoos. Wet your hair with warm water, take a small amount of shampoo in your hand and then rub it with fingers into your scalp and hair. Slightly and the only difference between regular and anti-dandruff shampoo here is that you should wait several minutes for dandruff shampoo to work his magic, once you’ve rubbed it into the scalp. This is not the case with regular ones. The process is pretty much the same as the process of applying conditioner. Pay attention when rinsing your dandruff shampoo out of the hair. It has to be done thoroughly. Otherwise, you’re risking skin irritation. Which one is your favorite? Share with us your thoughts and experiences in the comments below. Photos from: rob3000 / depositphotos.com, deagreez1 / depositphotos.com.